2 bios of Robert Shaw - both substantial, both hard to find and both expensive. It would be a good morning's work to find them side by side in an Oxfam shop, almost impossible because they look everything up on the web, so say Shelter or St Vincent de Paul. 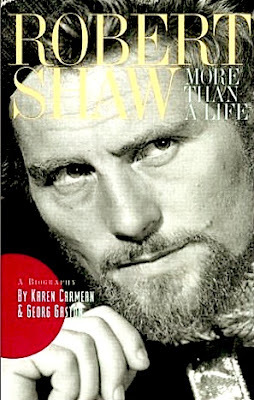 Robert Shaw (August 9, 1927 – August 28, 1978) was an English stage and film actor, playwright and novelist. 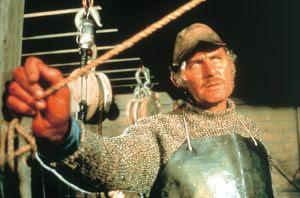 He still has a worldwide following, but he is mostly remembered for his role as Quint, the shark-obsessed fisherman in 'Jaws' and as the ruthless mobster Doyle Lonnegan in The Sting (1973). He was in Bond films, Robert Bolt costume films and played the coolly efficient heist mastermind/former mercenary Bernard Ryder aka "Mr. Blue" in The Taking of Pelham One Two Three (1974). He had a commanding, slightly sinister screen presence and was part of that hard living, rowdy crowd of Brit actors from the 1960s. (Richard Harris, Oliver Read, Richard Burton - all gone, sadly - hellraisers seldom collect their bus passes.) He also wrote novels which in the seventies had a sort of currency as 'modern first editions' but are now hard to sell and not valuable. None are worth as much as the books on him. "...I have a private archief from this unique person and I dream about him and think most of the time how sweet he was for childeren. Mr Shaw is deep in my heart because I discover his live and read this colourful biographie and I will thank Garmean and Gaston for this great great great book, thank you!!!!!!!!!!!!" Fossicking about on net I found a Shaw site with letters from fans saying how they missed him - many remember crying when he died. One intriguing note read -'My sister, Liz and I just had a look at your web page and thought it was great. We loved all the photographs and comments. Good job. By the way, we're actually his (Robert Shaw's) daughters and don't get the John French book as it's full of lies. Hannah.' These were 2 of Shaw's 10 children, 3 of which he had with the beuatiful Mary Ure. It does seem that the Carmean bio is preferred but the French bio is much more difficult to find. VALUE? The Carmean bio can be found for £60 to £100 in decent shape. Currently on the web there are only 2 copies of the French bio - an unpleasant ex lib copy at $90 and another at $450 from a chap who cannot give condition, a relister working out of Hialeah FLA. Presumably if you were unfortunate enough to order from the guy you would get the $90 ex lib copy. His feedback on Amazon often speaks of great delays in the provision of books.